One of Sladers Yard’s most popular painters, the well established artist Julian Bailey’s oil paintings and smaller drawings in pencil and gouache have sold all over the world and been exhibited successfully in numerous solo shows in Cork Street and at Sladers Yard. We were delighted to show Julian Bailey’s recent work this autumn. Please scroll to the bottom of the page to see the paintings. ‘Bailey’s paintings belong to a world of which he is himself very much a part. His art has the power to strike a rich chord; the ability to evoke the full choreography of life in all its timbre and cadence, light and joy. Extracts from Vivienne Light FRSA’s foreword to the catalogue for Julian Bailey’s At the Waterfront solo show in 2015. Julian Bailey works in oils on board, enjoying the resistance of the hard surface. ‘I have a fairly wide range of colours, but try to limit my palette as much as possible in one painting. I try to keep the colours fresh and clean, using clearly visible brush strokes which define the objects. I want the finished paintings to look spontaneous with everything in the right place, even if it has taken a lot of time with many changes and repainting.’ The results look remarkably effortless and spontaneous. His figures seem simple, yet are full of attitude, while his landscapes reach for the anatomy of the countryside to find just as much character and form as there is in his figures. Whatever they may be, the elements of his paintings give the sense of being in that place at that moment, just when everything comes together to make something remarkable. 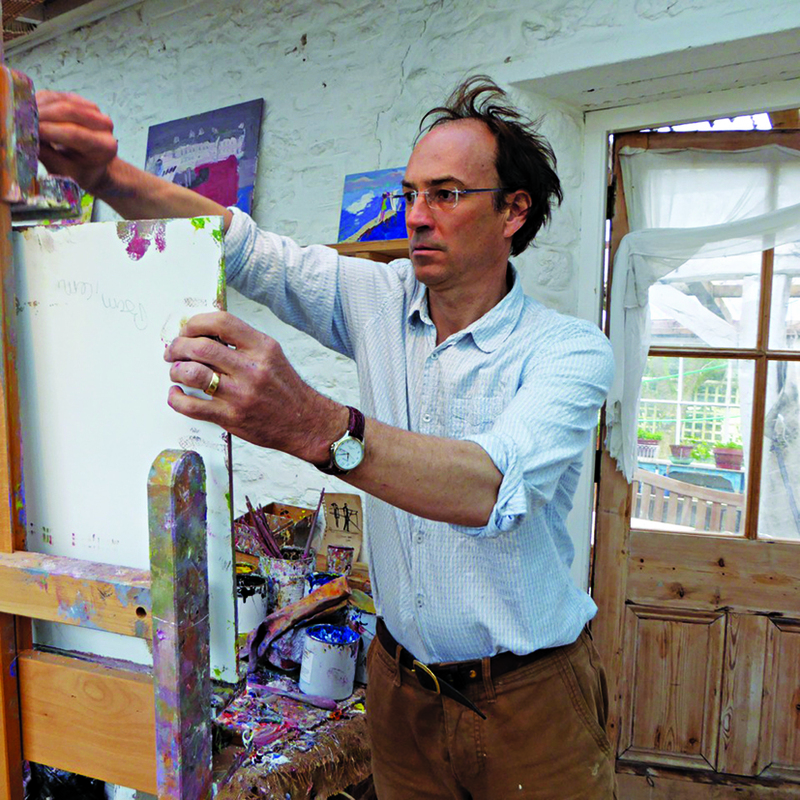 Artist Julian Bailey lives with his family near Dorchester. Born in 1963, he had his first successful exhibition at Malvern Public Library when he was still at school. He studied art at the Ruskin School while attending New College, Oxford and then went on to the Royal Academy Schools where he was awarded the Turner Gold Medal and later the Landseer Scholarship. He had his first one-man show in London in 1991 and has exhibited regularly since, joining Browse & Darby in Cork Street in 1999 as their youngest artist. He and his family moved to Dorset in 1998 when Julian began to paint landscapes, particularly the Dorset coast. In 2011 he was elected to join the New English Art Club and awarded the David Messum Prize. He also won the Manya Igel prize that year. His work is in numerous collections including HRH The Prince of Wales, New College Oxford, Pembroke College Oxford, Reed Executive, Old Mutual Assurance, Daiwa Bank, SG Warburg and more. He has had three solo shows at Sladers Yard and participated in a number of group shows.